This popcorn machine rental is a great addition to any indoor or outdoor movie parties. Easy-to-use & high output. The ultimate backyard movie party equipment rental. 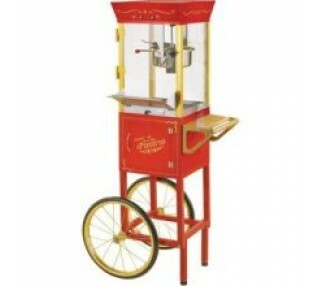 Delight your friends, family and guests with this classic popcorn machine. Nostalgic design but with modern features like tempered glass, stainless steel kettle with stirring system, warming light and kernel catcher. Makes up to 1 1/2 gallons of popcorn per batch, or approximately 100 small bags of popcorn an hour. These units do take a lot of power so we recommend using it on a separate electrical circuit from your movie equipment.